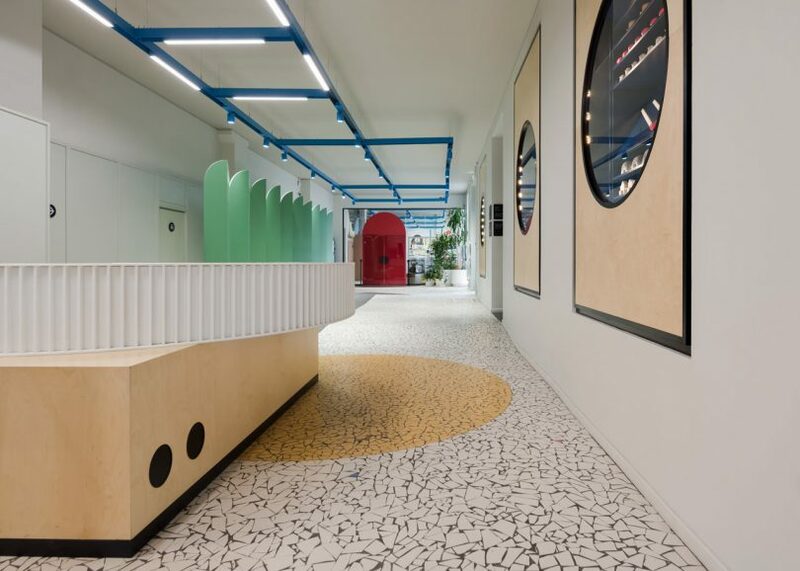 A playful new workspace in Moscow that gives nod to board games. Detsky mir (Children’s World) is a popular children’s retailer in Russia with over 700 stores requiring the company to move into new offices. With the company actively growing, they took over a former printing factory in Moscow and hired FORM to design a workspace that gives nod to board games. The playful design reflects memories of childhood marking the perfect spot for a children’s brand. Exaggerated proportions remind everyone of the skewed perceptions kids experience, and in this case, the imaginative objects and spaces might appear as places to play and not have any particular functionality when they actually do. This idea pops up everywhere, from the furnishings to the decorative details throughout. Toys greet guests within circular, glass-covered displays in the lobby, marking the start of the board game. Once the “game” has begun, it’s off to the open plan workspaces where workstations are placed near the windows while the darker central areas are now used for circulation. Popular games pop up in the design details as playful reminders. Each floor was given a color found in the Detsky mir logo ? red, yellow, blue, and green ? which shows up in the grid-like lighting systems suspended from the ceilings.